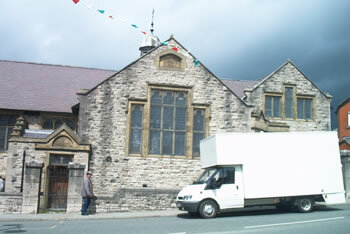 Lenten Hall Antiques - Location & Premises: Lenten Pool, Denbigh, North Wales, UK. LL16 3LG. The building was constructed in 1915-16 by James Hughes, architect of Denbigh, former assistant of the County Surveyor Richard Lloyd Williams. The building itself has been used by St. Mary's Church for many years as the Church Institute building. It is now a Grade (ii) Listed Building; listed for its special interest as a well-designed early Perpendicular-style former Church Institue in a prominent town-center location. If you want a closer look we'd be happy to show you round!